Something about this time of year brings out full-bodied meals. A lot of braising, stewing, and soup-making are usually in the works for the fall/winter months. 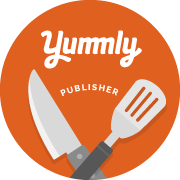 I guess it’s partly because of the cooling weather that progresses into bone-chilling cold that makes us want to get in the kitchen and cook up some soul soothing satisfying meal. Another part of this equation for me and many others is the comfort factor. Comfort foods bring out the nostalgia of the season too. With Thanksgiving and Christmas around the corner, we start breaking out traditional foods that make us feel good and remind us of home. 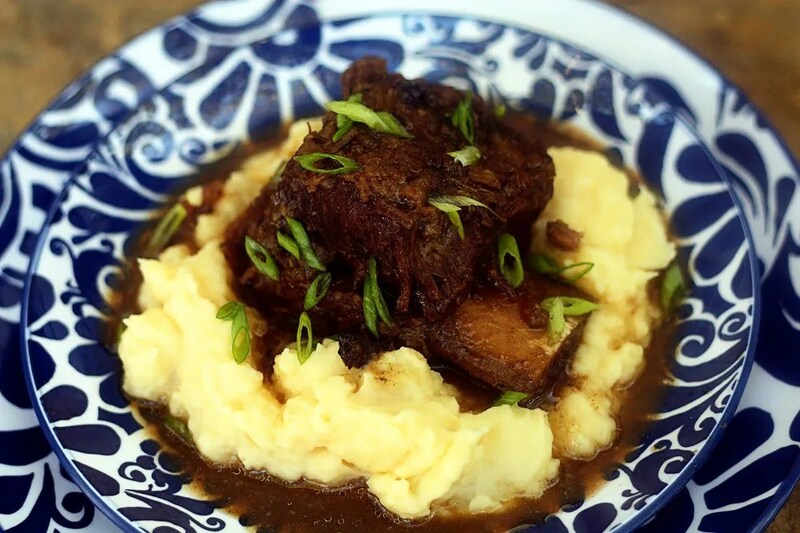 So, I’m in the comfort food mode with braised beef short ribs. These ribs are often found on sale and are definitely worth a second look because they are extremely meaty. They are like a thick piece of roast beef, they just have a bone. 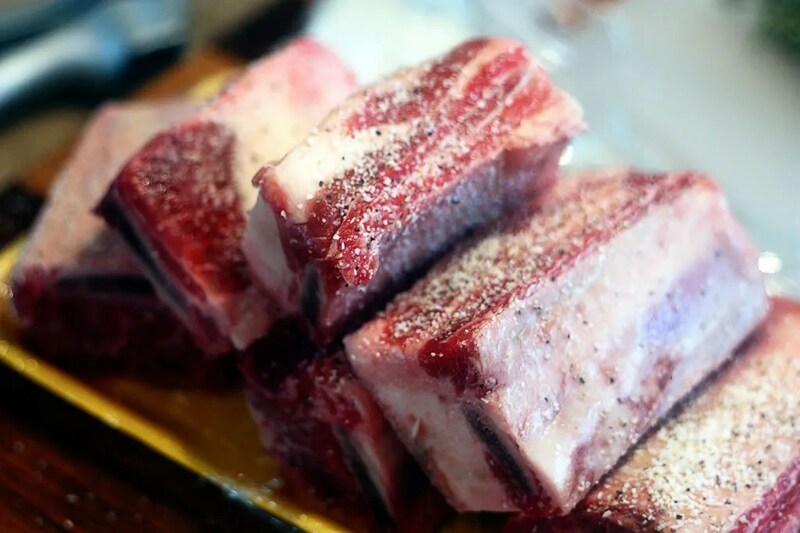 Bone-in meats, in my opinion, are some of the most flavorful and best, so I’m perfectly happy with using short ribs much in the same way I cook a roast. Start by seasoning the meat very well on all sides. I used salt and fresh cracked black pepper. Next, dredge each piece in seasoned flour to lightly coat. *It’s important to season the flour so that you have seasoning in all the layers of this dish. Just add a generous pinch or two of salt and pepper to your flour an mix in before dredging. Heat about 1/4 cup of oil in a heavy bottomed skillet and brown meat on both sides. Transfer meat to bowl of crockpot; sprinkle with thyme and additional fresh chopped garlic, if desired. 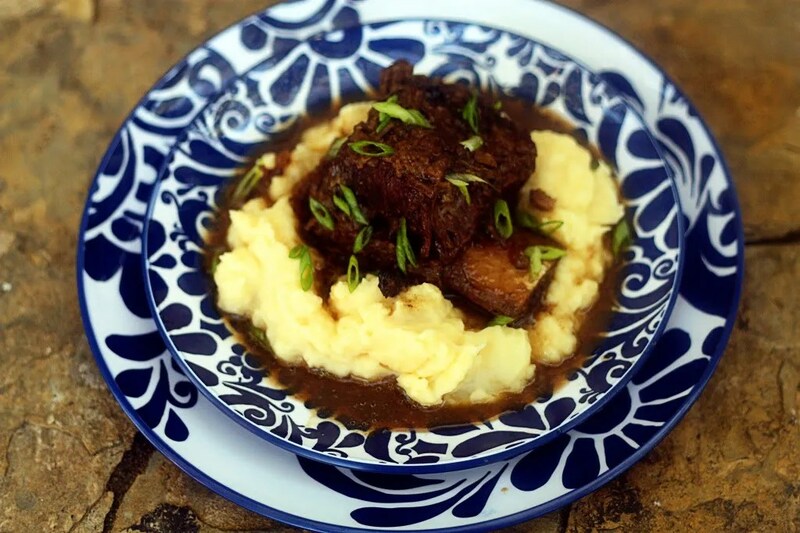 I like this served best on a pile of creamy, buttery fresh mashed potatoes…YUM! 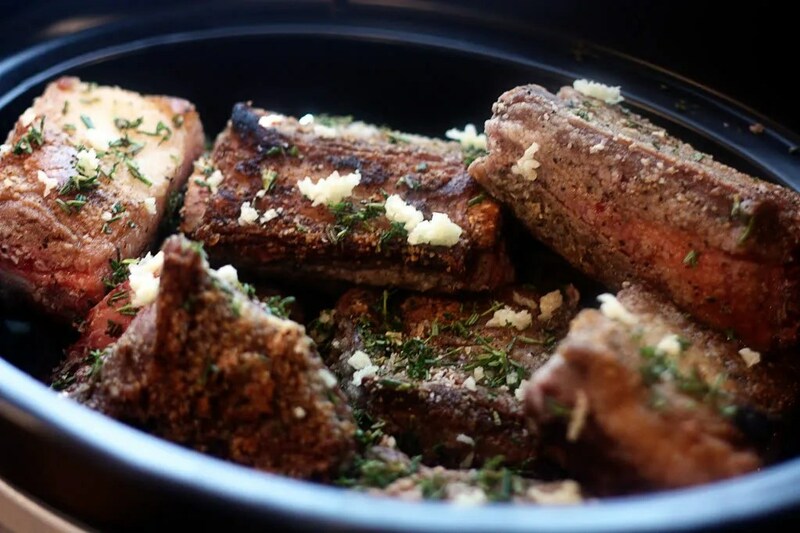 Pat short ribs dry and season on all sides with 1 teaspoon salt and ½ teaspoon fresh cracked black pepper. Combine flour with 1 teaspoon salt and ½ teaspoon fresh cracked black pepper and stir together. Dredge each piece to lightly coat with flour on all sides. 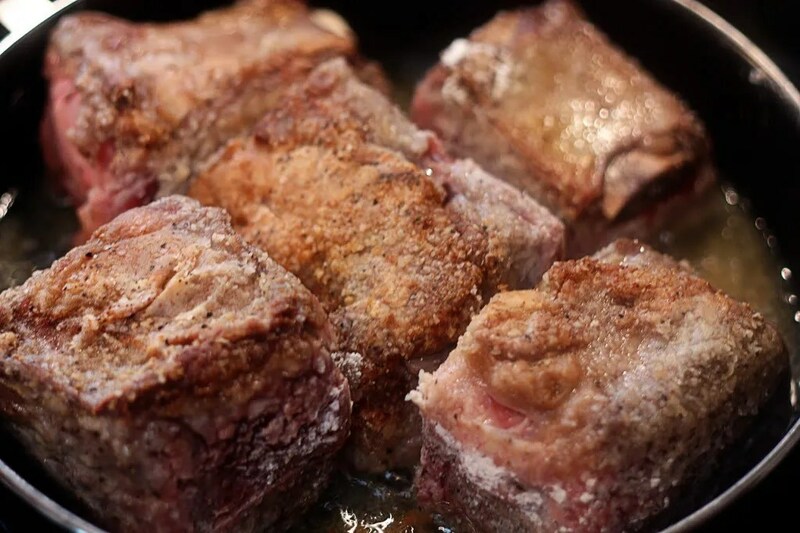 In a heavy-bottomed skillet, heat oil over moderately high heat until hot but not smoking and brown ribs in batches, transferring with tongs to a bowl of crockpot. Sprinkle with thyme and additional fresh chopped garlic, if desired. Add chopped onions and celery to pan and cook over medium heat, stirring, until golden. Add garlic and cook, stirring, 1 minute. Add wine, broth, Worcestershire sauce, deglazing the pan and bring to a boil. Pour over ribs in crockpot. Add pearl onions and carrots, stirring and pushing down to make sure they are covered by liquid. Set crockpot on low for 6 to 8 hours. *If you want to thicken the juices before serving, remove meat and vegetables to a plate and pour off juice (you may strain, if you’d like) into a large skillet and bring to a boil, reducing to the desired consistency. Reduce heat and return meat and vegetables to the pan and continue cooking for a couple of minutes until meat is heated through. 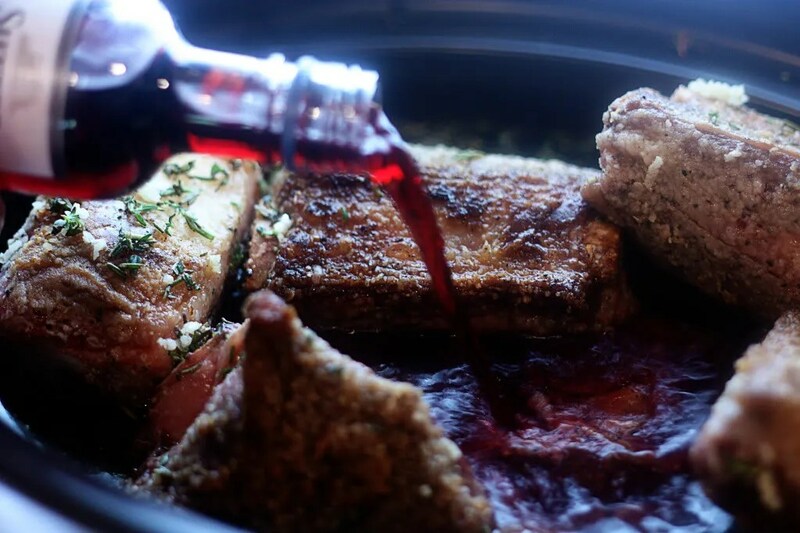 In a Dutch oven, heat oil over moderately high heat until hot but not smoking and brown ribs in batches, transferring with tongs to a bowl. Add chopped onions and celery to pan and cook over medium heat, stirring, until golden. Add garlic and cook, stirring, 1 minute. Add wine, broth, Worcestershire sauce, and bring to a boil. Add ribs including any juices that have accumulated in bowl. Add pearl onions and carrots, stirring and pushing down to make sure they are covered by liquid. 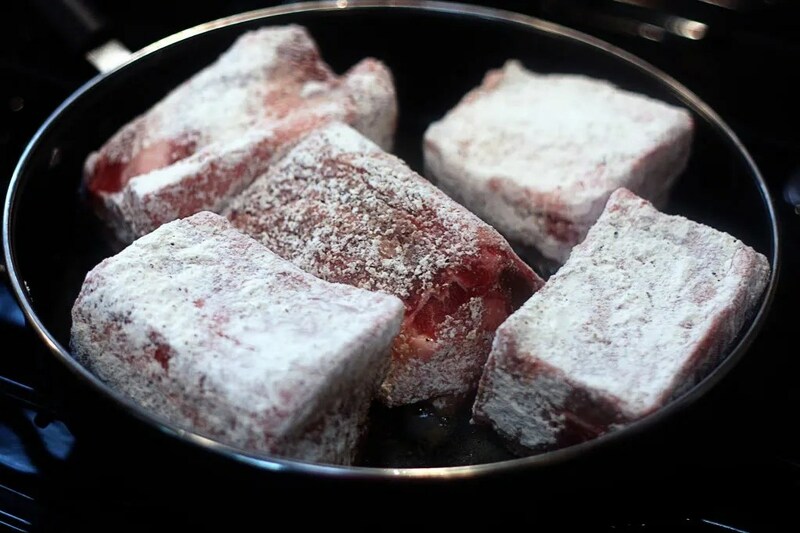 Cover Dutch oven with a tight fitting lid or foil and place in preheated oven for 1½ hours, or until meat is tender. Transfer meat, pearl onions, and carrots with a slotted spoon to a large bowl or platter. Boil braising liquid, stirring occasionally, until slightly thickened and reduced. Return meat and vegetables to pot and cook over low heat, stirring occasionally, until heated through.